Last fall, the VRC created an interactive timeline for Professor Murad K. Mumtaz’s course, By Land and Sea: Art, Culture, and Religion Along the Trade Routes of Asia. Professor Mumtaz’s timeline featured images of art forms including textiles, manuscripts, paintings, luxury items, sculpture, and architecture. 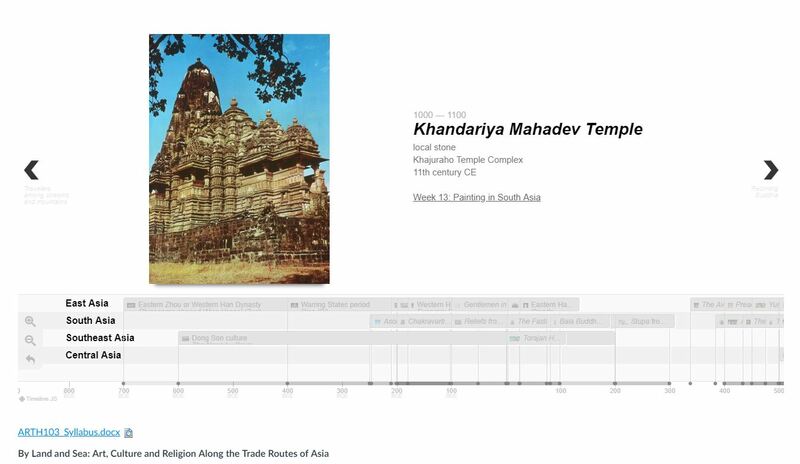 The first interactive timeline was created by the VRC in the Fall of 2015 for ARTH 101 Art Through Time. Students are able to access the timeline through the course’s front page on GLOW, the college’s course management software. After each class session, the timeline is updated with images of the works discussed. 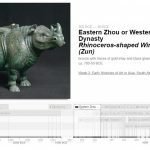 The details of the featured works are included in the timeline along with links to Artstor study groups or PowerPoint lectures. Students are able to zoom in and out as well as click through the timeline. Course timelines create an interactive study tool for students that provide a dynamic and always-changing front page on GLOW.